However, it is the various forms of Foeniculum :- Fennel, Sweet Fennel or Florence Fennel that are ‘best known’ through their use in cooking and / or the making of absinthe. Such fennel plants are often garden escapes, but Foeniculum vulgare has naturalised, being particularly associated with disturbed ground. and the banks of streams and rivers. 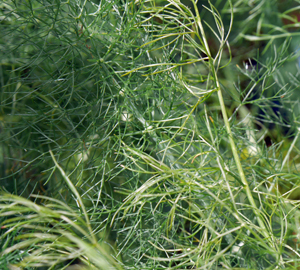 Though this fennel now has a world wide distribution, it probably originated in the Mediterranean region. It reproduces well by seed; so much so, that in some countries (like Australia and the USA), it is regarded as an invasive species or weed. Like the wild parsnip and alexanders, Fennel and Florence Fennel are umbellifers, that is, members of the Apiaceae (the Carrot family). The flowers of these plants are arranged in flat, umbrella-like heads or umbels. Fennel is a tall perennial, sometime growing to a height of 2 metres (6 feet) or more. The stems are hollow, grey green in colour, and 'shiny'. The leaves are very finely divided - having a pinnate structure with thread - like, ‘wispy’ leaflets. The leaves when crushed release a strong smell of aniseed - which is largely due to the compound known as anethole. 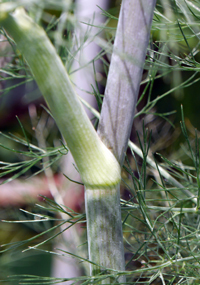 The essential oil obtained from fennel is fenchone; it has a bitter taste (but to a degree this may change according to where the plant is grown). 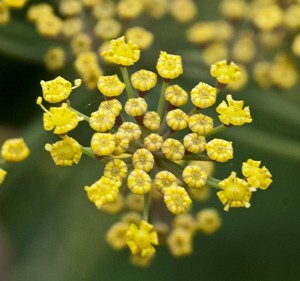 The individual flowers are small and yellow, but they are massed together in the umbel structures - providing a striking display for pollinating insects. The flowers form in July through to September, and the seeds when they form (September & October) are aromatic, with a similar aniseed flavour to that of the leaves and other parts. The florence fennel is derived from the natural or wild form of fennel - it is grown as a vegetable for its ‘bulbs’ or swollen leaf bases. A fennel bulb looks like a cross between an onion and the base of a bunch of celery. It is somewhat smaller than the natural form of the plant, and the leaf bases offer a sweet, anise like flavour. There is also a bronze form of fennel (Foeniculum vulgare 'Purpureum') that is much favoured as a foliage plant in the garden. The various herbal uses of fennel are detailed here and some of their culinary uses can be found here.